Sprinkle Sugar Cookies ~ the holidays may be over, but winter carries on…and these easy sprinkled sugar cookies will help light your way right through to spring. They’re perfect for just about any occasion you can throw at them, just customize the colors! I always get the baking urge in January after the holiday crush is over and I have time to enjoy it. These cookies probably should have made it into the Christmas lineup last month, but I figure a great sugar cookie is like a little black dress, it’s never out of place. Accessorize with pink or blue for baby showers, team colors for game day snacks, gorgeous crimson for Valentine’s Day, metallic for an anniversary bash, pastels for Easter…you get the idea. When it comes to sprinkles I’m a kid at heart. 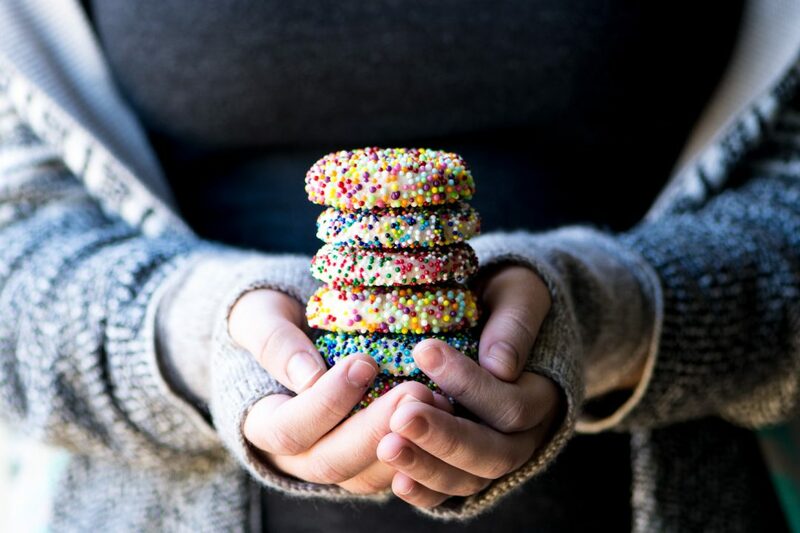 I can’t resist them, I love the colors, the shapes, the crunch… and there aren’t too many desserts that a layer of sprinkles won’t improve. Actual kids love them, too, and love to help make them, so if you’ve got bored housebound little ones hanging around on a snow day, whip up this quick sugar cookie dough and let them take it from there. 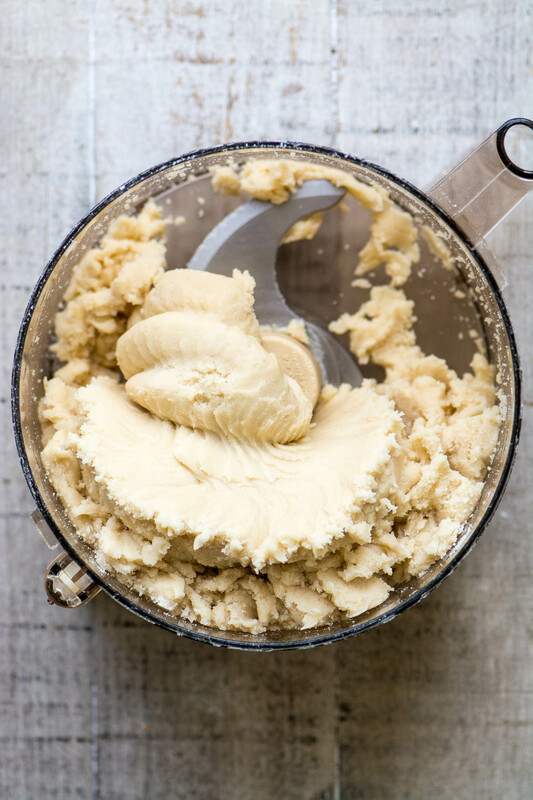 The dough comes together like magic in a food processor, no need for extra bowls or mess. You can see it has a beautiful velvety texture in the photo below. Just make sure your egg, butter, and cream cheese are at room temperature. There’s no need to chill it before baking, either. Love that. Once you’ve rolled your balls of dough in the sprinkles and got them completely covered, you’ll press down gently to flatten them a bit. They bake up into the perfect shape, slightly crunchy on the outside and soft on the inside. These cookies are just the excuse I need to out my sprinkle stash, I keep all the little bottles in a giant ziplock freezer bag so I can tote them around easily. Sprinkles last forever, so I’ve collected quite an assortment. Nonpareils ~ these are the itty bitty little round ones, and they’re the most historic of the bunch, dating back to the 1800s. They’re the messiest, too, and have a tendency to fly everywhere. Sprinkles ~ (Jimmies, hundreds of thousands) these are the classic long shapes and my favorites. 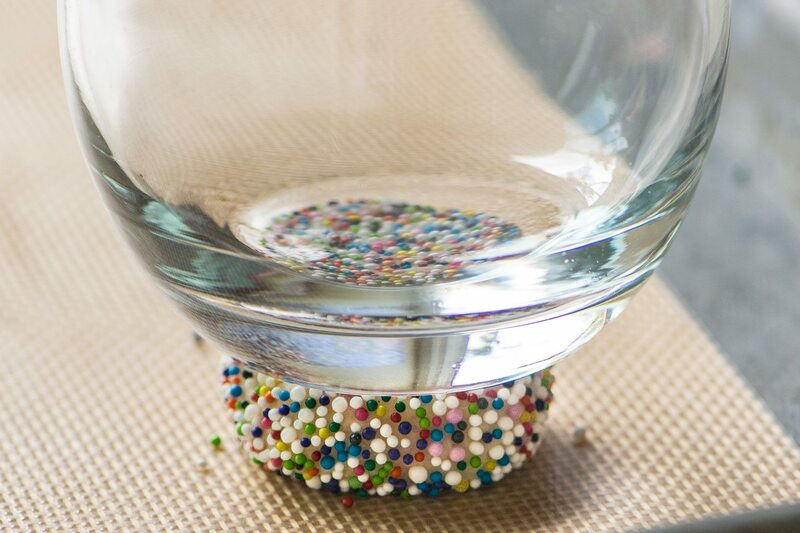 I’ll show you how to make them yourself, in this post: HOW TO MAKE HOMEMADE SPRINKLES. Dragées and pearls ~ larger balls with a hard coating, often in metallic colors. While these are pretty, I find them less appealing to eat. Confetti ~ (Quinns) these are the little matte finish disks. They come in other shapes, too. Multi-shapes ~ nowadays you can get sprinkles in just about any shape you can imagine, from stars and hearts to little holly leaves, shamrocks, and snowflakes. Edible glitter ~ super glitzy shimmer, and comes in lots of colors. Colored sugar ~ all types, from superfine to large crystal. You can MAKE YOUR OWN COLORED SUGAR, it’s a fun diy project. *You can also get all natural sprinkles, which are colored with vegetable dyes and are beautiful too, in a more subtle way. 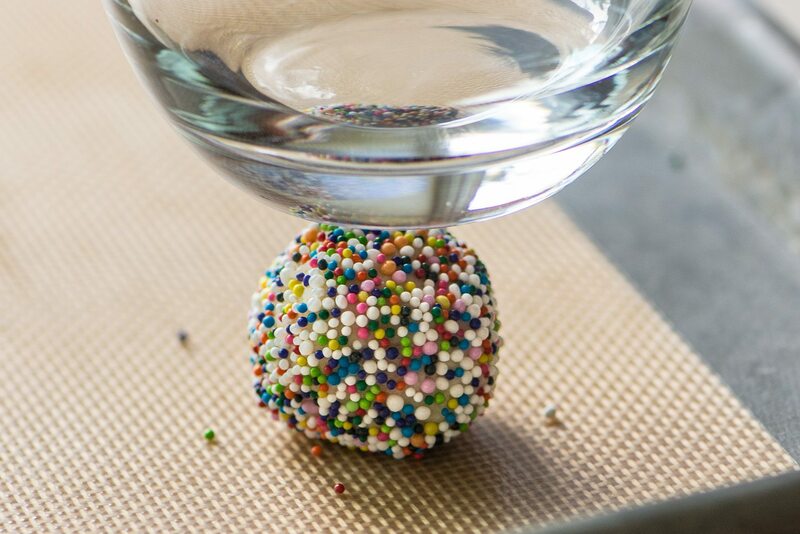 Put the sprinkles in a small dish deep enough to cover the ball of dough. The deeper the sprinkles, the easier it is to fully coat the dough. Work with one cookie at a time, the warmth of your hands will soften the dough and allow the sprinkles to adhere better. Push the ball of dough lightly but firmly against the sprinkles to encourage them to thickly coat the surface. After flattening the cookies, add additional sprinkles to the top. As the cookie bakes and spreads, they will fill in gaps. 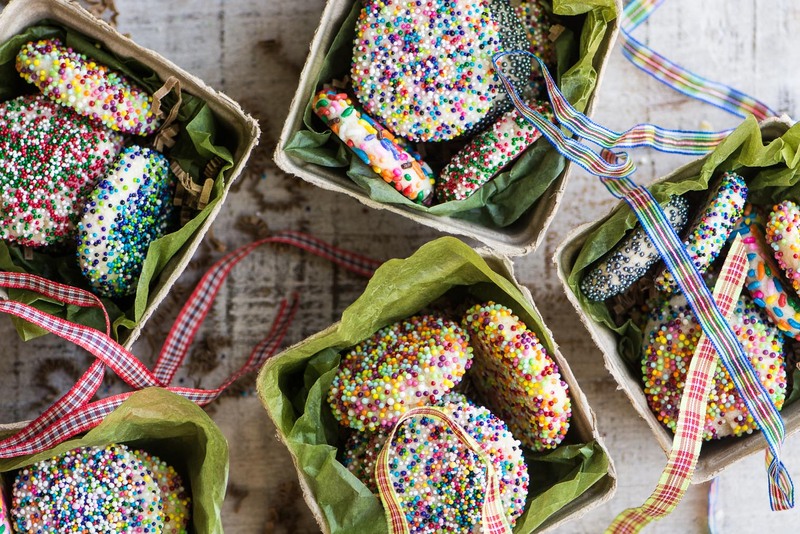 These sprinkle sugar cookies are great for gifting because they’re nice and sturdy. Put the first 4 ingredients in a food processor and pulse to combine. 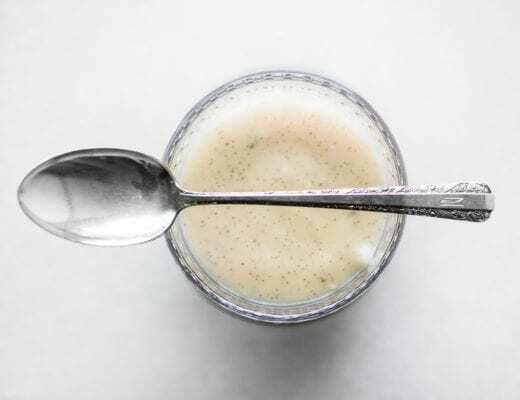 Add the butter, sugar, and cream cheese, and pulse until the butter is well incorporated. Add the egg and extracts and process until the dough comes together in a lump. Scoop bits of dough out with a 1 1/2 inch cookie scoop and roll into a ball with your hands. 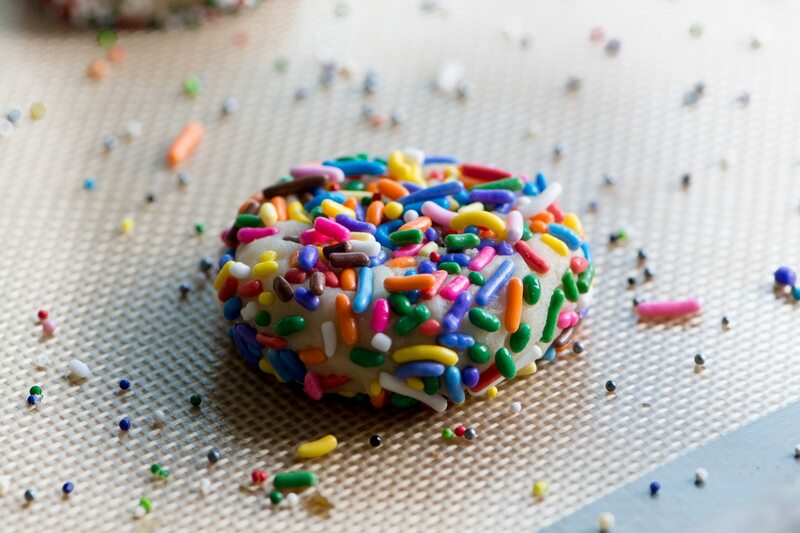 Roll the dough in sprinkles, making sure to get them completely coated. Bake, 2 inches apart, for 8 minutes. Let them cool for a minute on the cookie sheet and then transfer to a rack. I’m going to make a chocolate version of these next, I will probably try substituting about 1/4 cup of the flour with an equal amount of unsweetened cocoa powder. 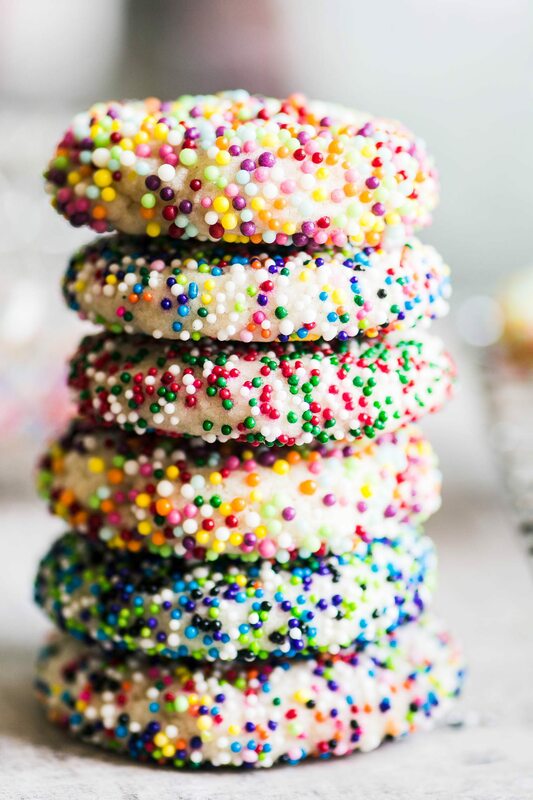 Don’t forget to pin these easy Sprinkle Sugar Cookies! It’s a medium cookie scoop, and equals about 1 1/2 Tbsp, approximately. 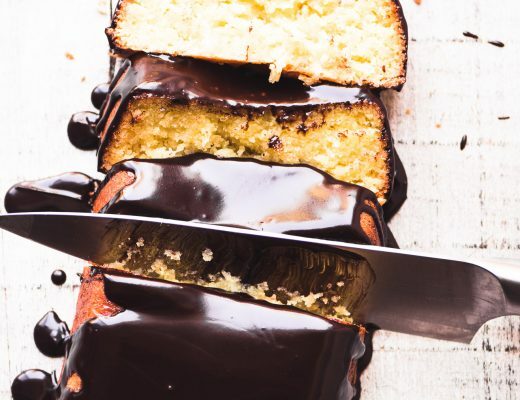 Do you think I could make these with almond flour to make them gluten free? I thought the slight almond flavor would be good. I would think it would be better to use a good all purpose gluten free baking mix, rather than just almond flour Kristin, because the almond flour alone will make these cookies too delicate. Would you freeze the dough with or without the sprinkles? Without, then defrost and coat with the sprinkles before baking. Sugar cookies freeze well, Chauncey, but to be honest I’m not sure about the sprinkles, they could bleed a little bit when you thaw them. I would make the dough and freeze it, then thaw and bake the cookies. These cookies are so pretty! I love that you used all of the different sprinkles on them! Isn’t it lucky for us they keep forever? I LOVE sprinkles too.i buy them in bulk 5lb bags and store in pretty glsss jars..look pretty in the kitchen and alwsys on hand? Thank you Albert, it’s always such fun to photograph anything ‘sprinkled’! Perfect and unicorn approved. HAPPY FOOD. I’m really happy to see all your recipes . Yup, sugar cookies are always in fashion! So good at any time. These look terrific — so pretty. And tasty, too, I’ll wager. :-) Thanks! These are SO beautiful! Do you have any suggestions as a substitute for the cream cheese? I have a family member who is allergic to cream cheese only! I’m not sure if she can tolerate Neufchatel cheese, Maura, but that’s very similar. These cookies just scream happy – I love them! Love your sprinkles! Now let’s talk about your fingerless gloves…! How fun these are! I love that the dough is made in the food processor! You are right, the dough looks so creamy and silky!! Honestly Beth the food processor makes these so easy and mess free, it’s the best part! These cookies are so pretty with all these different sprinkles, pinned it! 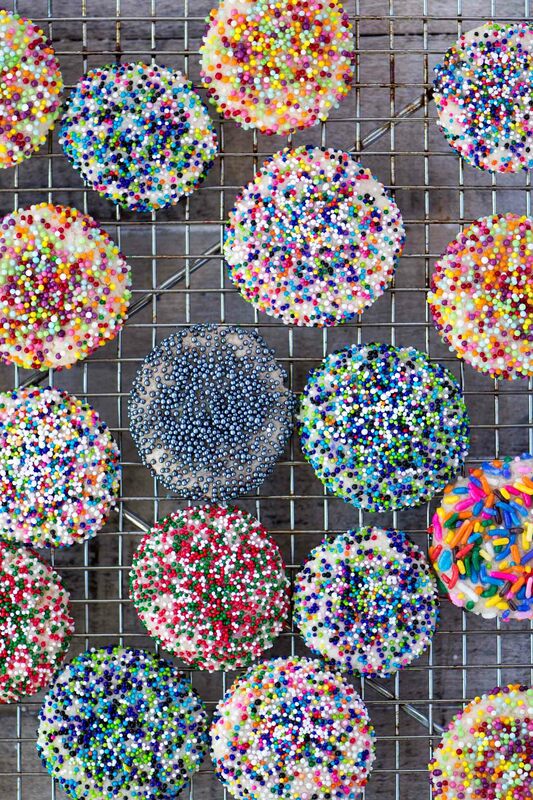 Gorgeous photos and never knew there were so many different types of sprinkles! WOW! Thanks for all the tips on getting the sprinkles to stick. I am imagining these colored for Valentines, Mardi Gras (wouldn’t that be fun?! ), St. Patty’s….and on! Aww these are so beautiful! 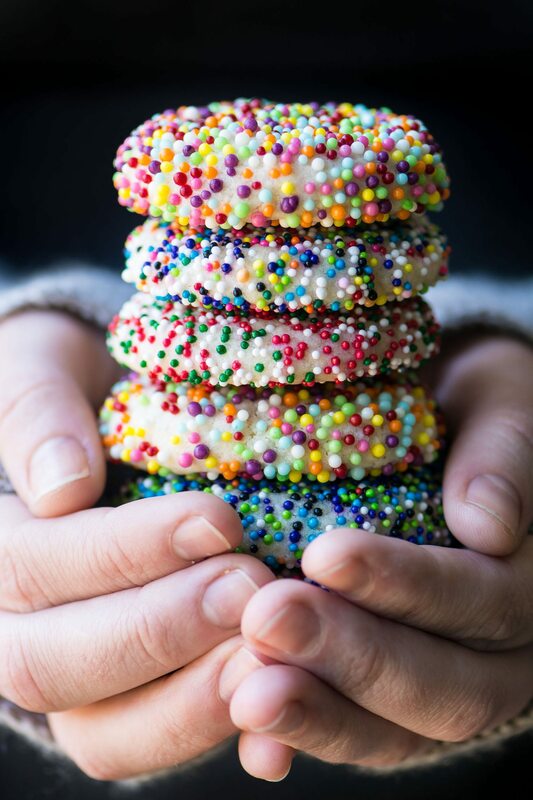 Love the puffy cookies and all those happy sprinkles. They are perfect for any occasion or just because I’ve made it two weeks without a cookie! Haha, going two weeks without a cookie is the perfect excuse to try one of these, Tricia. Adorable! I’m a sprinkle fanatic too and have shoe boxes full of them in my pantry. I think it’s time to have a cookie party! Just looking at your pretty cookies makes me want to celebrate! Simple yet awesome with all the colourful sprinkles!